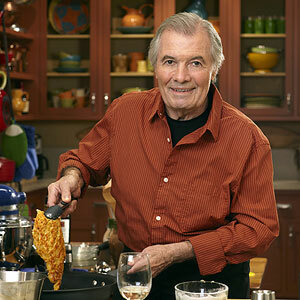 This series is the culmination of chef Jacques Pepin's 60+ years of experience in the kitchen. Jacques welcomes his daughter Claudine, granddaughter Shorey and lifelong friends and colleagues to cook with him. In each ingredient-driven episode, the 75-year-old culinary legend provides step-by-step instruction for creating a mouth-watering dish and demonstrates his impeccable technique, from chopping an onion or peeling a softly boiled egg to breaking down a leg of lamb. The series encourages novices to take their first culinary steps and entices seasoned home chefs to try something new. Cured Salmon In Molasses; Tuna Steaks With Tapenade Coating; Tuna Tartare On Marinated Cucumbers; Poached Salmon In Ravigote Sauce; Ray Meuniere With Mushrooms. Grilled Swordfish With Spicy Yogurt Sauce; Baked Mackerel With Potatoes And Onions; Seafood With "Handkerchiefs"; Poached Trout In Vegetable Broth. Meringue Shells With Chantilly Cream; Macaroons; Chocolate Roll; Chocolate Souffle Cake With Raspberry Sauce. Garlic Mashed Potatoes; Potato Ragout; Gratin Dauphinoise; Cream Puff Potatoes. Tartelettes Aux Fruit Panaches; Tarte Tatin; Meme's Apple Tart; Individual Chocolate And Nut Pies.